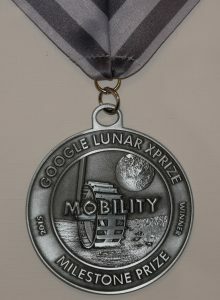 As the final deadline of the Google Lunar XPRIZE was in sight, GLXP yesterday announced that “there will not be a launch by March 31st, 2018, and our grand prize will go unclaimed”. As former competitors we wanted to share a few thoughts on the prize. While the grand prize will go unclaimed, we don’t think this means there is no winner. Quite the contrary – the GLXP provided inspiration and an incentive for people all around the world to come together and work towards a shared dream of landing on the Moon. A look back at our history shows it was the GLXP that led to the formation of PTScientists. In our book, that is a “win”. The new-space sector has grown. Teams like ours, Astrobotic, and others, who were inspired by the GLXP have grown into fully commercial space companies, and are now playing a part in the global space sector. That is a “win”. And the Moon – how could we ever forget the Moon? International interest in Moon exploration, habitation, and experimentation has grown immensely over the past few years. The Director General of ESA has proposed the “Moon Village”, NASA is looking at deep-space gateways in cis-lunar space, India and China both have upcoming missions to the lunar surface. After a spell being out of the spotlight, the Moon seems firmly back in play. That is a “win”. Knowing first-hand how complex Moon missions are, we are would be lying if we said the GLXP announcement came as a total surprise to us. When we withdrew from the competition we had to make a choice between optimism and realism. We have always thought of Mission to the Moon as more than a shot at winning some prize money – we want to conduct valuable science and run a proof-of-concept mission for our future ventures. For that reason, we took the decision it was better not to rush our launch. As the old fable goes – “slow and steady wins the race”. Everyone in the space community is familiar with the phrase “Space is hard” – or as we like to say “Hell yeah, it’s rocket science!”. Though our catchphrase takes a rather light-hearted approach, we take our work very seriously. We are committed to developing a sustainable solution for lunar research and contributing to future space exploration. We look forward to continuing that journey and hope that the end of the GLXP will not also spell the end of the remaining teams. If we want humanity to leave the cradle of Earth, there is plenty of work to be done.